Home / News / Artists / Green Tease Podcast: Can art get people travelling more sustainably? Green Tease Podcast: Can art get people travelling more sustainably? Road vehicles such as cars, trucks and buses are Scotland's largest - and growing - source of carbon emissions but what role can artists play in increasing active travel and contributing to a more sustainable Scotland? 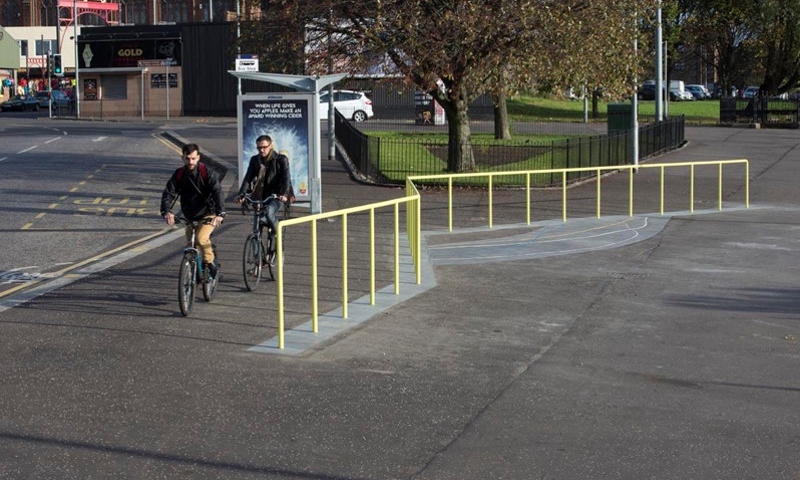 Listen to the podcast from Green Tease: Arts and Active Travel, a collaboration between Sustrans Scotland and Creative Carbon Scotland. Can art get people travelling more sustainably? To allow you to hear the full presentations and a summary of discussions we have created Creative Carbon Scotland first ever podcast “Can art get people travelling more sustainably?”! The podcast is available on Itunes, Google Podcasts (on your phone), Spotify and a bunch of other platforms. We welcome your feedback on the podcast as we’re aiming to produce recordings of more of our events, to allow a wider audience to benefit from the information and to ensure that there’s a means of participating when environmental or other considerations mean people choose not to travel. You can also get the visuals from the presentations by taking a look at the slides, linked to in the section below. Cosmo Blake, Arts and Diversity Officer at Sustrans Scotland, kicked off the event by showing diverse examples of public art works commissioned on Scotland’s cycle paths. He also gave an update on the ArtRoots Fund which offers grants to communities for artistic and aesthetic improvements to the National Cycle Network. Arts producer and consultant Ben Spencer then gave a presentation on how artistic practices and projects have sought to affect social change. If an artist was involved from the very start of projects (for example path building), could they be more visual and appealing? How can health and safety requirements be managed while also encouraging the creative flair of an artist? And how can you evaluate the impact of public artwork on cycle ways? This event was part of Green Tease, a network and ongoing informal events programme, connecting creative practices and environmental sustainability across Scotland. Creative Carbon Scotland runs the Green Tease Open Call, which is a funded opportunity supporting sustainability practitioners and artists to exchange ideas, knowledge and practices with the aim of building connections and widening understanding of the role of arts in influencing a more sustainable society.